As some may already know, I made the decision to donate 100% of my profits from the Networking for VMware Administrators book to the Alzheimer’s Association about a year ago when the release was made public. I often joked at events that even if you thought the book was crap, you at least were making an indirect donation to a very good cause. I recently received my royalty check for the second half of 2014 (the royalty payment process is slow). The check is for $2,183.82. 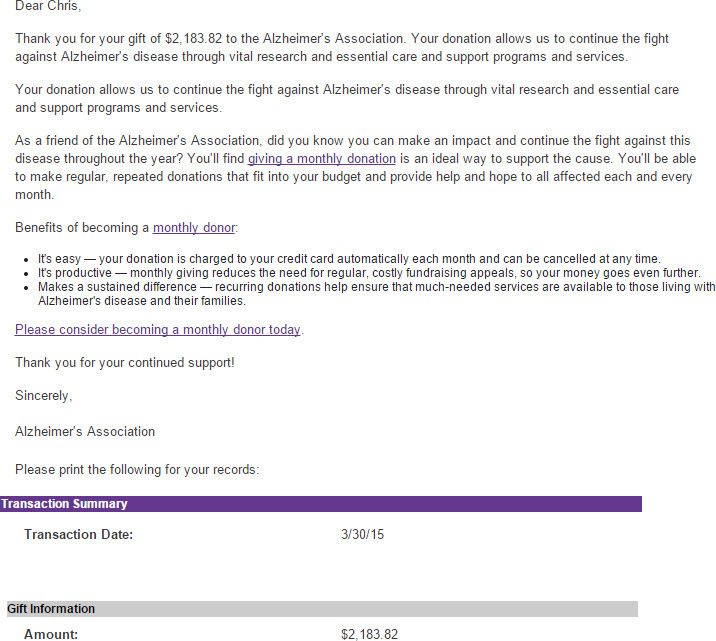 All of that money has been donated to Alzheimer’s Association and I can’t say enough to thank all of you who have supported the book over the past year. Nicely done, Chris! This is community at its finest and I love the book. You are such a great role model Chris – way to go!